Posted by Dave Emory ⋅ May 6, 2016Post a comment Email This Post Print This Post Tweet This! 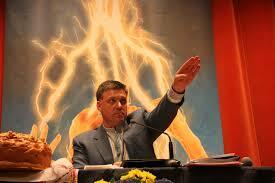 Oleh Tihanybok, leader of the OUN/B successor organization Svoboda, part of the Maidan coup and post-Maidan governments. Stephan Bandera, head of the OUN/B. COMMENT: In numerous broadcasts, we have noted the Orwellian rewrite of Ukrainian history to deny the perpetrators of the Holocaust in that country and whitewash the Nazi-allied OUN/B and UPA. A recent article in Foreign Policy (published by the CFR and consequently VERY mainstream), further develops the activities of Volodymyr Viatrovych, appointed as head of the Institute of National memory by Viktor Yuschenko and then re-appointed by Petro Petroshenko. After the Yushcneko government left power and prior to the Maidan coup, Viatrovych was in the U.S., working as a fellow at Harvard University’s Ukrainian Research Institute. This is in line with the fundamental role of the OUN/B-based American emigre community in the generation of the Orange Revolution and the Maidan coup. Recall that Yuschenko married the former Ykaterina Chumachenko–Reagan’s Deputy Director of Public Liaison and a key operative of the OUN/B’s American front organiztion the U.C.C.A.–and had Roman Zvarych (Jaroslav Stetsko’s personal secretary in the early 1980’s) as his Minister of Justice. “The Historian Whitewashing Ukraine’s Past” by Josh Cohen; Foreign Policy; 5/02/2016. . . . . Advocating a nationalist, revisionist history that glorifies the country’s move to independence — and purges bloody and opportunistic chapters — [Volodymyr] Viatrovych has attempted to redraft the country’s modern history to whitewash Ukrainian nationalist groups’ involvement in the Holocaust and mass ethnic cleansing of Poles during World War II. And right now, he’s winning. . . .
. . . . In May 2015, Ukrainian President Petro Poroshenko signed a law that mandated the transfer of the country’s complete set of archives, from the “Soviet organs of repression,” such as the KGB and its decedent, the Security Service of Ukraine (SBU), to a government organization called the Ukrainian Institute of National Memory. . . .
. . . . The controversy centers on a telling of World War II history that amplifies Soviet crimes and glorifies Ukrainian nationalist fighters while dismissing the vital part they played in ethnic cleansing of Poles and Jews from 1941 to 1945 after the Nazi invasion of the former Soviet Union. . . .
. . . . And more pointedly, scholars now fear that they risk reprisal for not toeing the official line — or calling Viatrovych on his historical distortions. Under Viatrovych’s reign, the country could be headed for a new, and frightening, era of censorship. . . .
. . . . The new law, which promises that people who “publicly exhibit a disrespectful attitude” toward these groups or “deny the legitimacy” of Ukraine’s 20th century struggle for independence will be prosecuted (though no punishment is specified) also means that independent Ukraine is being partially built on a falsified narrative of the Holocaust. By transferring control of the nation’s archives to Viatrovych, Ukraine’s nationalists assured themselves that management of the nation’s historical memory is now in the “correct” hands. . . .
. . . . In 2008, in addition to his role at TsDVR, Viktor Yushchenko, then president, appointed Viatrovych head of the Security Service of Ukraine’s (SBU) archives. Yuschenko made the promotion of OUN-UPA mythology a fundamental part of his legacy, rewriting school textbooks, renaming streets, and honoring OUN-UPA leaders as “heroes of Ukraine.” As Yuschenko’s leading memory manager — both at TsDVR and the SBU — Viatrovych was his right-hand man in this crusade. He continued to push the state-sponsored heroic representation of the OUN-UPA and their leaders Bandera, Yaroslav Stetsko, and Roman Shukhevych. . . .
. . . . After Viktor Yanukovych was elected president in 2010, Viatrovych faded from view. . . . During this period Viatrovych spent time in North America on a series of lecture tours, as well as a short sojourn as a research fellow at the Harvard Ukrainian Research Institute (HURI). He also continued his academic activism, writing books and articles promoting the heroic narrative of the OUN-UPA. In 2013 he tried to crash and disrupt a workshop on Ukrainian and Russian nationalism taking place at the Harriman Institute at Columbia. When the Maidan Revolution swept Yanukovych out of power in February 2014, Viatrovych returned to prominence. . . .
. . . . The new president, Poroshenko, appointed Viatrovych to head the Ukrainian Institute of National Memory — a prestigious appointment for a relatively young scholar. . . .
. . . . To that effect, Viatrovych has dismissed historical events not comporting with this narrative as “Soviet propaganda.” [This is true of information presented by anyone that tells the truth about the OUN/B heirs now in power in Ukraine–they are dismissed as “Russian dupes” or “tools of the Kremlin” etc.–D.E.] In his 2006 book, The OUN’s Position Towards the Jews: Formulation of a position against the backdrop of a catastrophe, he attempted to exonerate the OUN from its collaboration in the Holocaust by ignoring the overwhelming mass of historical literature. The book was widely panned by Western historians. University of Alberta professor John-Paul Himka, one of the leading scholars of Ukrainian history for three decades, described it as “employing a series of dubious procedures: rejecting sources that compromise the OUN, accepting uncritically censored sources emanating from émigré OUN circles, failing to recognize anti-Semitism in OUN texts.” . . . . Even more worrisome for the future integrity of Ukraine’s archives under Viatrovych is his notoriety among Western historians for his willingness to allegedly ignore or even falsify historical documents. “Scholars on his staff publish document collections that are falsified,” said Jeffrey Burds, a professor of Russian and Soviet history at Northeastern University.“ I know this because I have seen the originals, made copies, and have compared their transcriptions to the originals.” . . .
. . . . Seventy historians signed an open letter to Poroshenko asking him to veto the draft law that bans criticism of the OUN-UPA. . . .
. . . . After the open letter was published, the legislation’s sponsor, Yuri Shukhevych, reacted furiously. Shukhevych, the son of UPA leader Roman Shukhevych and a longtime far-right political activist himself, fired off a letter to Minister of Education Serhiy Kvit claiming, “Russian special services” produced the letter and demanded that “patriotic” historians rebuff it. Kvit, also a longtime far-right activist and author of an admiring biography one of the key theoreticians of Ukrainian ethnic nationalism, in turn ominously highlighted the signatories of Ukrainian historians on his copy of the letter. . . .
. . . . UPA supreme commander Dmytro Kliachkivs’kyi explicitly stated: “We should carry out a large-scale liquidation action against Polish elements. During the evacuation of the German Army, we should find an appropriate moment to liquidate the entire male population between 16 and 60 years old.” Given that over 70 percent of the leading UPA cadres possessed a background as Nazi collaborators, none of this is surprising. . . .
. . . . Last June, Kvit’s Ministry of Education issued a directive to teachers regarding the “necessity to accentuate the patriotism and morality of the activists of the liberation movement,” including depicting the UPA as a “symbol of patriotism and sacrificial spirit in the struggle for an independent Ukraine” and Bandera as an “outstanding representative” of the Ukrainian people.” More recently, Viatrovych’s Ukrainian Institute of National Memory proposed that the city of Kiev rename two streets after Bandera and the former supreme commander of both the UPA and the Nazi-supervised Schutzmannschaft Roman Shukhevych. . . .
Ukrainian singer Jamala’s melancholic tune about Soviet dictator Josef Stalin’s 1944 deportation of the Crimean Tatars was crowned the winner of the 2016 Eurovision Song Contest early Sunday, an unusual choice for the kitschy pop fest. “1944” It ain’t no “A Love Supreme” but The Ministry of Truth must be thrilled with the win. The message the bad guys in 1944 were the Soviets and the bad guys today the Russians. Dave, there is nothing new here. Before Viatrovych was born, we were taught this narrative in Saturday Ukrainian schools during the 1960’s and 1970’s. Our WWII generation immigrant parents set up these schools and taught us that Bandera, Shuchevych, and others from the OUN and UPA were heroes and freedom fighters. I deduced from the context of your comment that the “Saturday Ukrainian schools” were in the U.S.